The photograph is black and white, but the dresses were green and white plaid. My mother had sewed them for us, all alike, their short sleeves and full skirts decorated with rickrack. All five of us wore them to the annual family reunion picnic. The little girls in the photo aren’t quite as identical as the dresses. My sister and my two cousins, all aged four going on five, are smiling prettily, sitting in graceful poses with their skirts spread around them in neat circles. My younger cousin, not yet a year old, is willing to sit still and have her picture taken but looks a little confused. Then there’s me, aged just two. I’m sitting in the back row with my skirt spread out over my chubby legs that stick straight out in front of me. I’m smiling, sort of, because I’m sure someone told me to smile, but I’m not looking at the camera. I’m looking at one of the two older girls in the picture, who are second cousins to the rest of us, and I’m not happy. Not because I didn’t like them; at that stage in my young life, I didn’t even know them. But I knew one thing for sure—they did not belong in this picture. They didn’t have green and white plaid dresses. They were wearing shorts and blouses. They didn’t match. 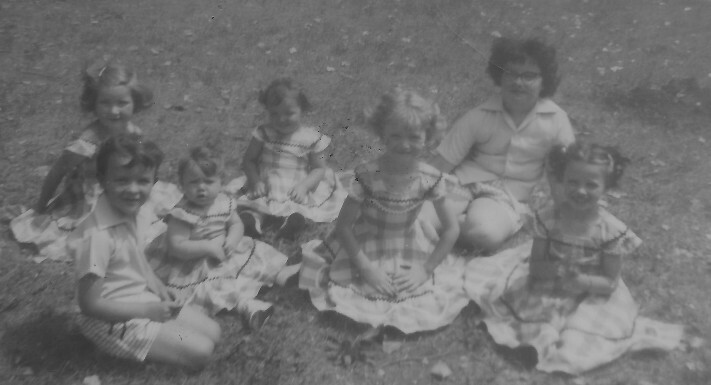 The whole point of the photograph, as I understood it then (and still do, now that I think about it), was to preserve an image of the five of us in our matching dresses. Our mothers had sat us down on the grass and arranged our skirts just so in order to show them to best advantage. Then, after all the fussing and preparation, before the picture was actually taken, somebody invited the other two girls to join us. I clearly remember my feeling of indignation. Including them when they didn’t match simply was not right. It missed the whole point of taking the picture. I didn’t object or cry or make a fuss about it. Even if I had, I don’t suppose anyone would have realized just what I was objecting to. I just sat there, smiling dutifully through my scowl, knowing full well that the grownups weren’t doing this the way it should have been done. It would seem that an option would have been to take one picture of the five of us and another of the seven of us. But this was in 1953, when developing a roll of pictures was expensive for struggling young families. So we all sat in our identical dresses; the interlopers sat in their nonconformity; the mother with the camera pointed and shot; and that was that. But this isn’t the whole story when it comes to those matching dresses. At some time during this same reunion, apparently I eluded my parents, wandered off, and ended up in the middle of somebody else’s family picnic. Maybe I was still mad about the picture. But it’s far more likely that I just followed some older kids or was merely meandering. In any case, someone from the other group brought me back safe and sound, knowing exactly where I belonged because of the dress I was wearing. You would think, to a two-year-old, an experience like this would have been memorable, even frightening. It certainly was for my parents. But I don’t remember it at all. Maybe getting lost wasn’t all that scary. Or else one group of grownup legs around some picnic tables looks a lot like another, and I had no idea I was lost. Whatever the reason, the only big deal for me that day was having our picture taken with the matching dresses. All these years later, it’s useful to remember this story as I hang out with some of my youngest grandkids. Most of the time I have no idea what they might remember or what they are thinking. It is clear, though, that they have some very decided opinions. It’s probably wise to have a little respect for those opinions. After all, someday they just might put stories about their early memories all over the Internet. I just hope they aren’t the type to hold grudges.